First, on Friday night I climbed Wild Understatement at LPT which is kind of a direct version of Statement of Youth with an independent start and finish. Wild Understatement is certainly wild! The start takes a very improbable line over a massive roof which goes with surprising ease once the right holds are found..while blindly groping about! The route then joins Statement after its traverse for three bolts before moving left (crux move) into a stunning finger crack to finish. Late tides meant we climbed almost till dark, being Friday night I went straight to the Heights in Llanberis which was well attended. It was great to be able to see so many good friends in one go, times like these remind me how good living in North Wales is! The route gets the grade of 8a+, making it the first route of this grade for me to climb. This is exciting for me since it's the first time in a year and a half that I've broken into a new grade. I did my first 8a in Nov 2011, since then I've done a total of 8 routes which get 8a. In that time I had a quick play on a couple of harder routes but the '+' grade seemed to have the effect of making the climbing feel desperate! On Wild Understatement I capitalised on my familiarity with Statement of Youth, this certainly maked a big difference psychologically, knowing that in the middle I would be on familiar ground. Even so I was surprised to get Wild Understatement on my first proper redpoint! As always with climbing, it never ends! I wonder if I will need to do another 7 or 8 8a+'s before 8b feels doable! I hope not, since that sounds like a lot of hard work! Here's my 8's logbook from the past year or so, looking back through my UKC logbook this evening has brought back lots of happy memories of trips, people and places reminding me that these routes are much more than just a tick next to number. 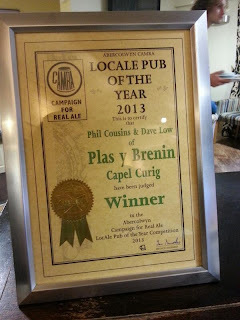 The other equally important highlight for me this week has been Plas Y Brenin winning CAMRA Pub of the Year 2013 out of about 150 pub's in the Abercolwyn area! I've worked at PYB (part-time) for the past 7 years and about the last 5 years part-time on the bar. In this time I've seen the bar go from strength to strength. We always have a couple of our own ales (brewed especially for us by Bragdy Nant who are based just down the road in Llanrwst) on tap as well as a guest ale which changes weekly from an amazing selection of local breweries, usually Purple Moose, Great Orme or Conwy. Add into the mix a great selection of Scottish (and Welsh!) whiskeys, lots of Welsh cider, free WIFI, great coffee and dare I say it good people! And it's a winning concoction. 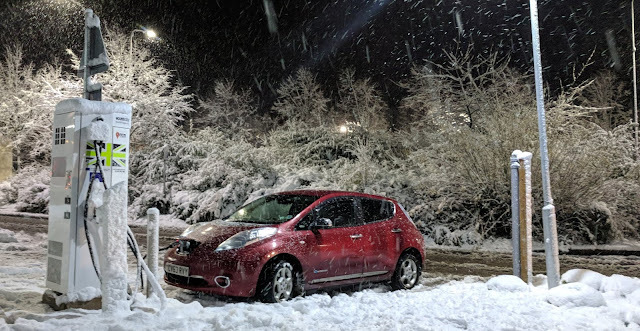 A couple of second later....priorities! I can't claim to have have played a big part in this award since these days I'm down to one evening a week but nonetheless I felt very proud. Well done to everyone involved in particular Dave Low, Phil Cousins and Robin. Winder Morning Nov 2010..waking up in my van to find that my water tank had frozen, and gas wouldn't work coffee had to wait but the view was enough to get me out of bed!